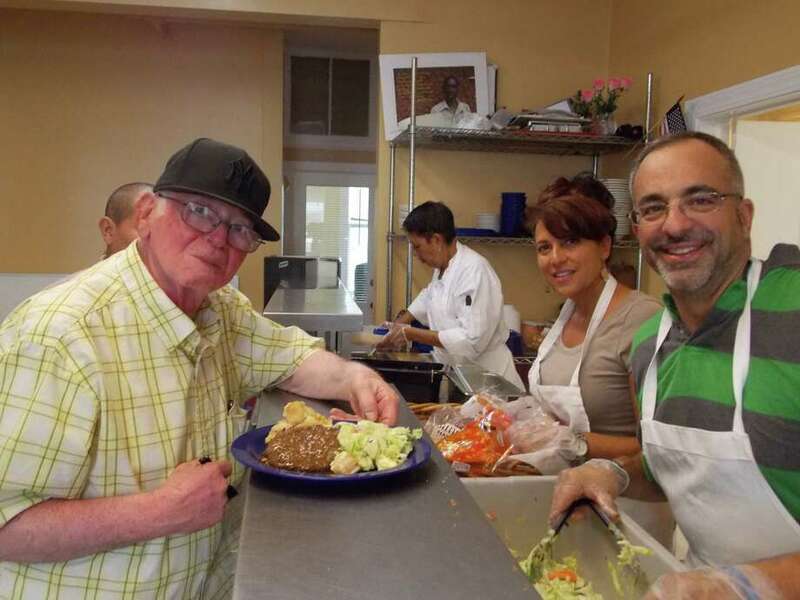 Bridgeport Rescue Mission members recently served food to the hungry. The group is in need of a new cooler, after theirs broke last month, and a Darien family has stepped in with a matching gift for all donations raised. Pacific House, in celebration of its commitment to ending homelessness in Fairfield County, is hosting its 17th annual Pacific House Gala. On Oct. 12, over 500 of residents, business and community leaders will gather together for the evening. The gala will begin at 6 p.m. at the Hyatt Regency Greenwich, and will honor DeAnne and James Calcagnini, of Darien, for their longtime support of the organization. Former Major League Baseball player and manager Bobby Valentine will be master of ceremonies. Advance tickets are on sale beginning at $250, and sponsorships are available. Visit pacifichouse.org/gala to learn more. This month, the Geary Gallery of Darien is featuring “Meditative Oceans,” a collection of abstract paintings of Massachusetts artist Rosemary Banfield. Her exhibit runs until Oct. 31 at the gallery at 576 Boston Post Road in Darien. Banfield lives on the outskirts of Boston, where she works from her home studio as a full-time painter and illustrator. She was born and raised in Johannesburg, South Africa, and studied at the Johannesburg College of Education, specializing in elementary education and art. As a teacher and an artist, Banfield experienced firsthand the positive effects art and creativity had on the children she taught, and this engendered in her a deep love of illustration and visual storytelling. A favorite subject for Banfield is water, and more specifically, the beach and ocean. The paintings inspire meditation and introspection, when observed. She has exhibited and sold paintings throughout South Africa and the United States and has illustrated two children’s books. The paintings featured in her latest exhibit are availabile for acquisition. Admission is free. To view some of her work, visit the online gallery at www.gearygallery.com/?artists=rosemary-banfield. Geary Gallery is open to the public Tuesday through Saturday, 9:30 a.m. to 5 p.m. For more information, call 203-655-6633 or visit www.gearygallery.com. Nicholas Saggese, of Darien, graduated with a degree in commerce business administration from the University of Alabama in August. Chase Yarnell, of Darien, graduated from the University of New Haven in August with a degree in criminal justice. The following Darien residents enrolled in St. Lawrence University in Canton, N.Y. as part of the class of 2022: James F. Batson, Evan J. Carpenter, Connor W. Darby, Catherine G. Van Elslander and William Wilson. Darien resident Kaela Buggy enrolled in Belmont University in Nashville, Tenn.
Jane R. Becker, collections management associate at the Metropolitan Museum of Art, will continue the “Human Form in Space: Sculpture” series on Oct. 11 at 11 a.m. at the Darien Community Association. On the heels of a year that marked the 100th anniversary of sculptor Auguste Rodin’s death, major sales of Camille Claudel’s work, and the opening of the Camille Claudel Museum in France, Becker will examine the interactions of both the lives and the art of these two late 19th-century figures. The sculptor Claudel’s inventive and empathic representations of the human body are little known in the country. Among the subjects to be explored will be the legacy of Rodin, the nature of his influence on Claudel as well as Claudel’s on him, and the relationship of their artworks to their tumultuous affair. All lectures will be followed by a luncheon by Diane Browne Catering. Single lecture with luncheon admission is $55, or $50 for DCA members, and payment is required for all lunch reservations by noon on the Friday preceding each lecture. Lecture only (without luncheon) is $25, or $20 for DCA members. Walk-ins welcome for lecture only. However, it is recommended that reservations and payment be made 24 hours in advance to assure a seat. Register online through dariendca.org, or contact the DCA directly at info@dariendca.org or 203-655-9050, ext. 10. The DCA is at 274 Middlesex Road in Darien. A Darien family has pitched in after the Bridgeport Rescue Mission’s walk-in cooler failed beyond repair in September. The group needs to raise $40,000 to replace the cooler, and a local family has given a matching donation to assist the group. According to the organization, the $40,000 needed will pay for a new walk-in cooler as well as a concrete foundation, and associated installation costs. In addition, they had to rent a refrigerated truck at an additional cost of $1,500 per week in order to continue to provide their programs, which include serving more than 550,000 meals per year to the hungry in the area, so additional donations are welcome. Funds can be donated at theimpactvine.org/project/urgent-help-purchase-a-cooler-for-bridgeport-rescue-mission.